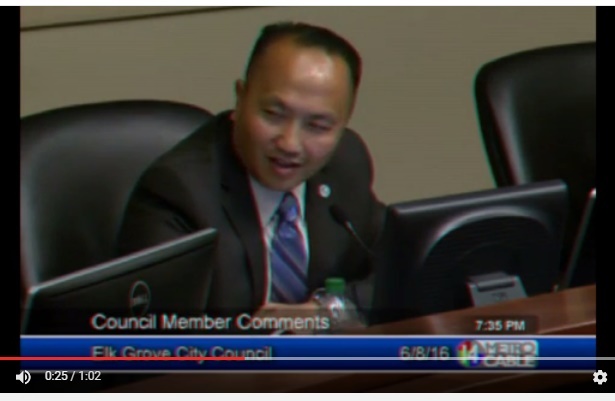 Perhaps sensing the lost opportunity of not earning their mayoral endorsement, Elk Grove Vice Mayor Steve Ly wasted no time in lashing out at members of the Elk Grove Police Officers Association. Ly, who is one of six candidates seeking to replace Elk Grove Mayor Gary Davis, learned last week the influential employees association representing rank and file Elk Grove Police officers awarded its endorsement to Elk Grove Planning Commissioner Kevin Spease. Ly is the only city council incumbent in the race and the only candidate to have held elected office in the Elk Grove area. Last week in its announcement that it would endorse Spease, the Elk Grove POA noted Spease's commitment to public safety. Greg Moore, President of Elk Grove POA, said of Spease "He is not only a leader in the community but shares our commitment to keeping our community safe." Ly, who is a current member of the Elk Grove City Council, wasted not time criticizing the leadership of the Elk Grove POA. In a story published in Friday's edition of the Elk Grove Citizen, Ly accused the employee public safety group of nefarious behavior. “These types of backroom deals are what I stand against and have worked my entire career to prevent in order to bring about transparency,” Ly told Citizen reporter Lance Armstrong. Ly also claimed he was never invited for an interview by the POA. Along with those from Firefighters, the Elk Grove Chamber of Commerce and the Sacramento Bee Editorial Board, the Elk Grove POA endorsement is one of the most important endorsements any Elk Grove candidate can earn. The greatest value the police officers support for candidates is their use in political mailers, which is frequently the only source of information about a candidate in local elections for large segments of the electorate, in touting their public safety credentials. In reaction to Ly's accusations, Spease took to social media this morning and condemned the Vice Mayor. "Steve Ly owes Elk Grove Police Officers an apology," Spease wrote in a Twitter post. Steve Ly owes Elk Grove Police Officers an apology.